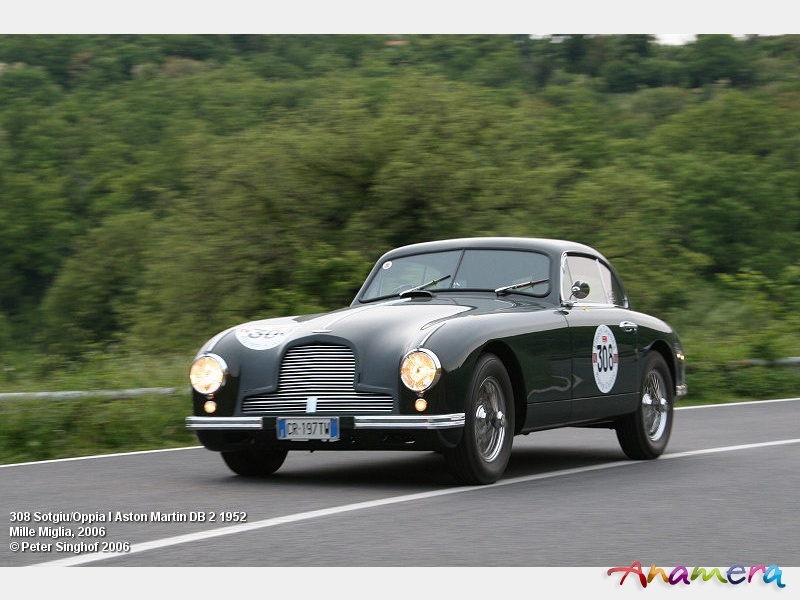 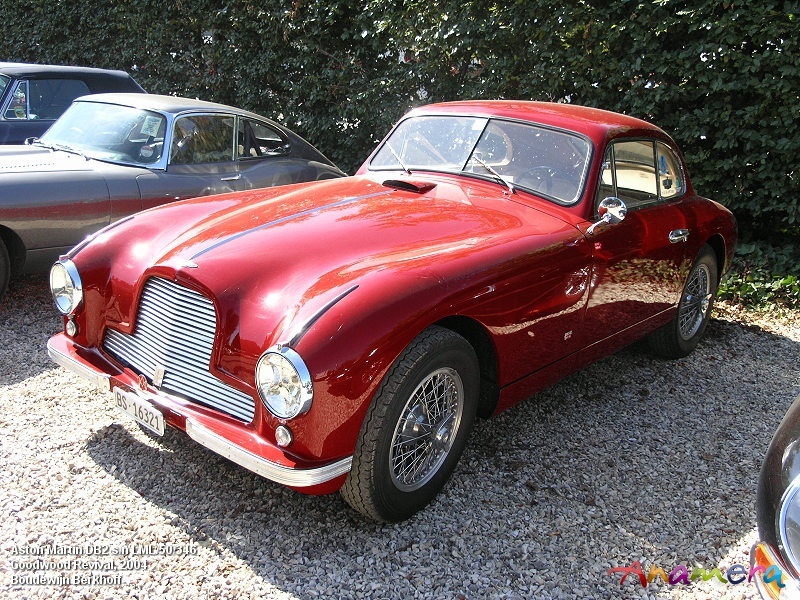 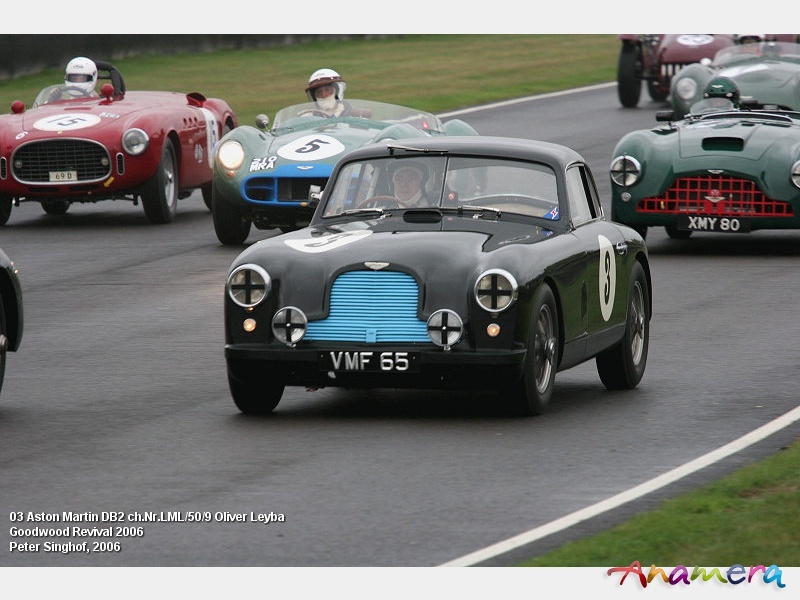 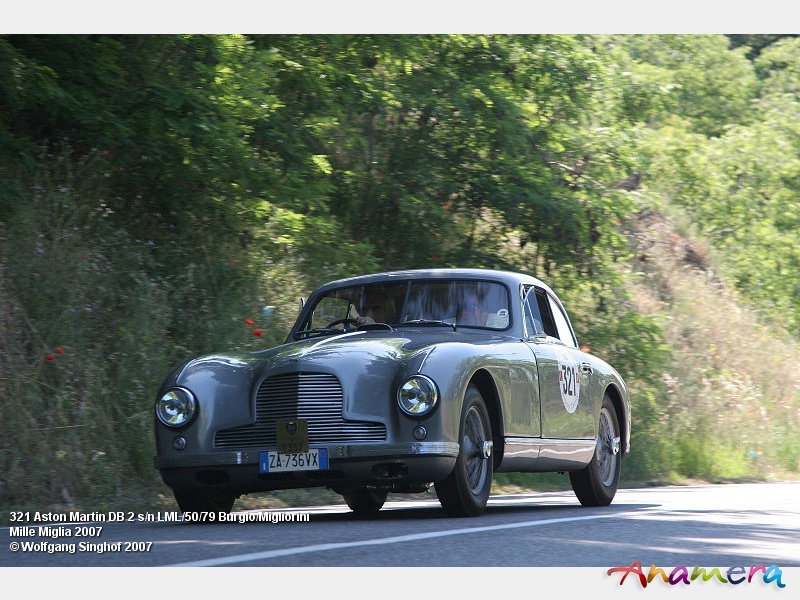 In 1949 the first Aston Martin DB2 was produced it was powered by a 2.580 litre engine which produced 105 bhp at 5000 rpm, the Vantage engine delivered 125 bhp at 5000 rpm. 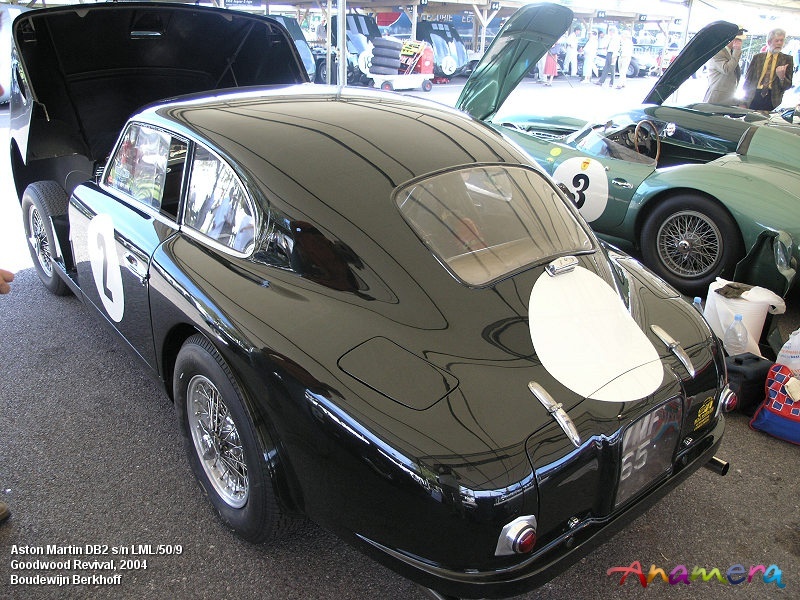 Frank Feeley designed the 2 seater sporting saloon, with unique feature, the whole front body section opened forward to grant easy access to engine and suspension, which was later also found on the Jaguar E-Type. 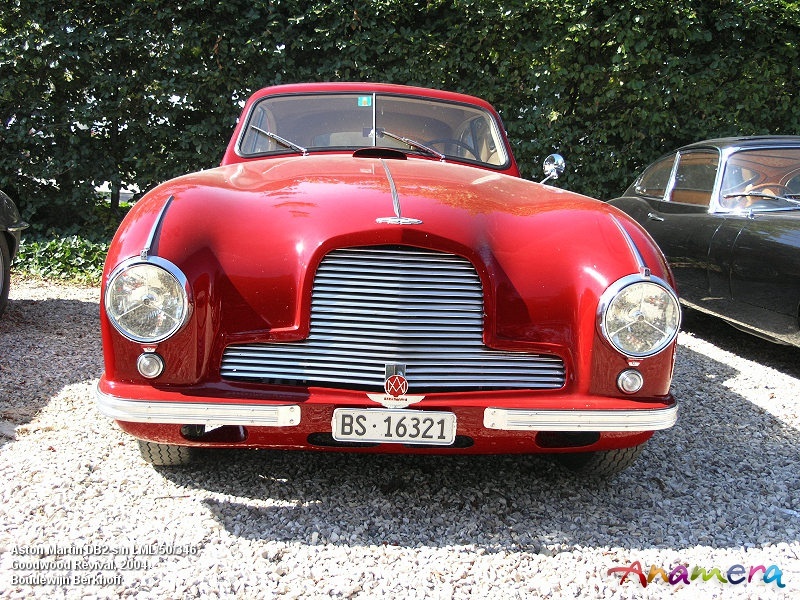 In 1949 3 prototypes were produced. 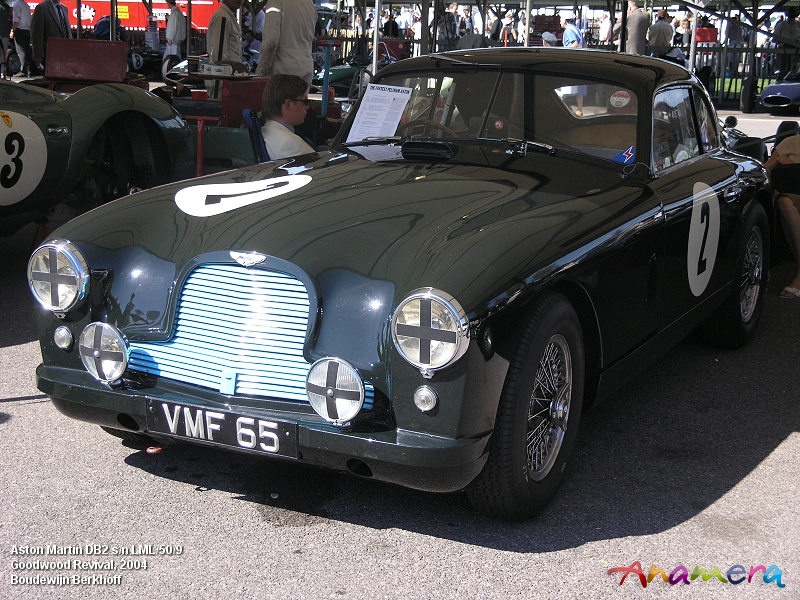 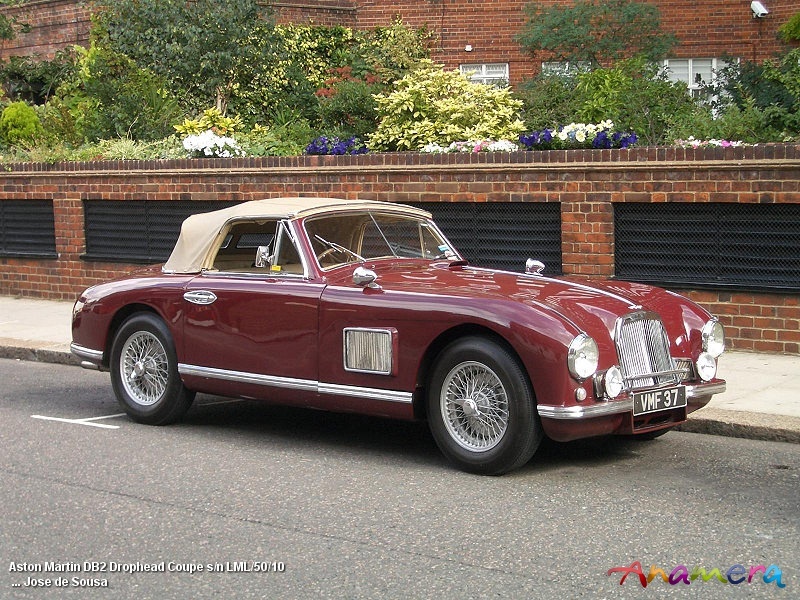 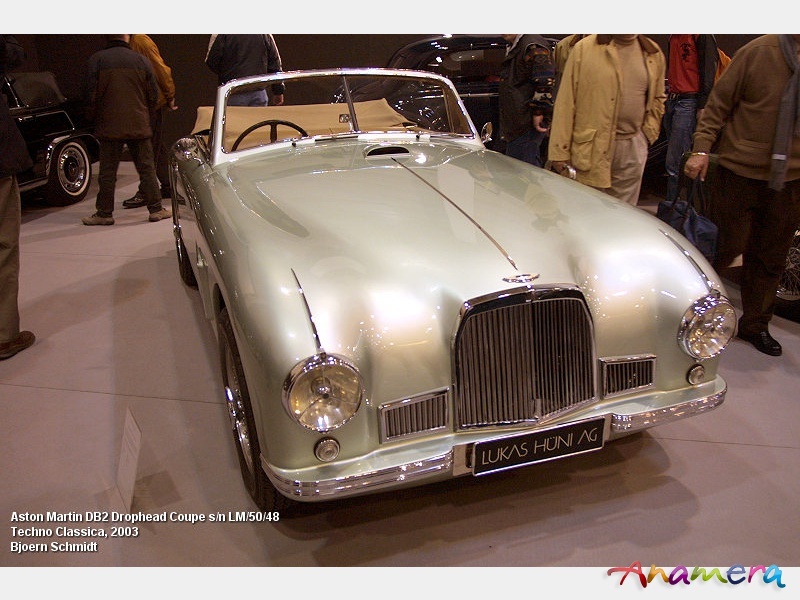 The production prototype LML/49/4 (UMC 272) was powered by a Lagonda engine and for David Browns own use. 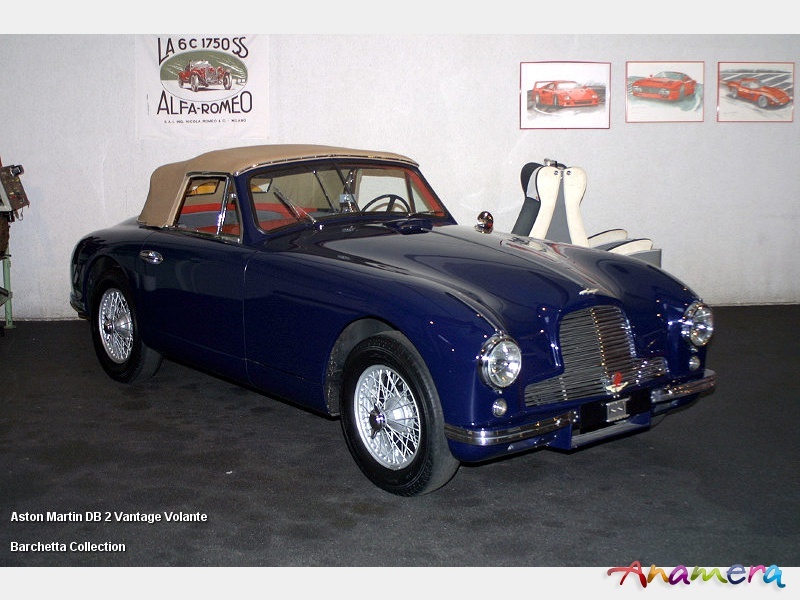 The experience gained with these cars resulted in the production models LML/50/5 (VMG 606) and LML/50/6 was the New York Motor Show car. 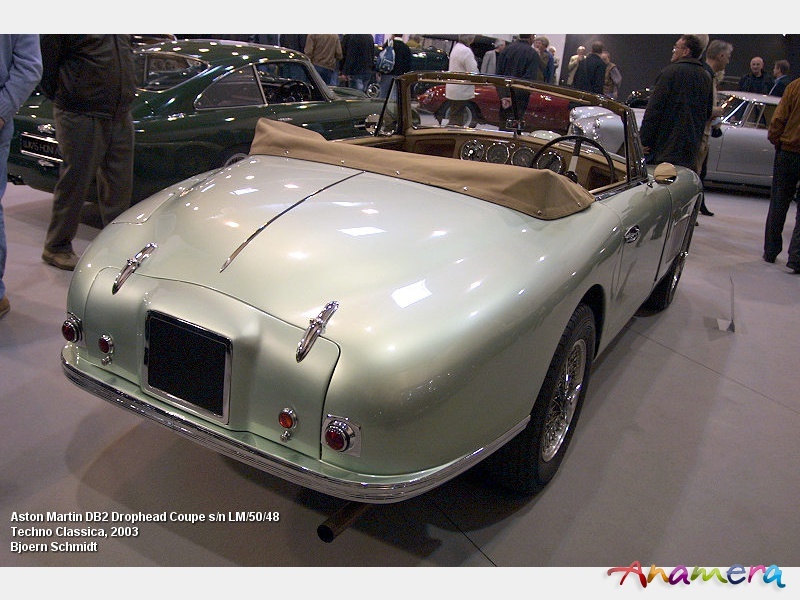 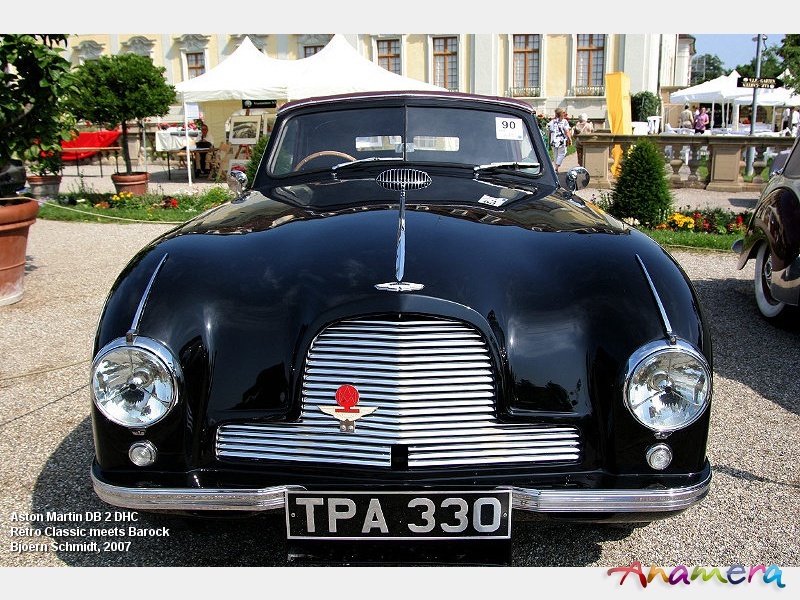 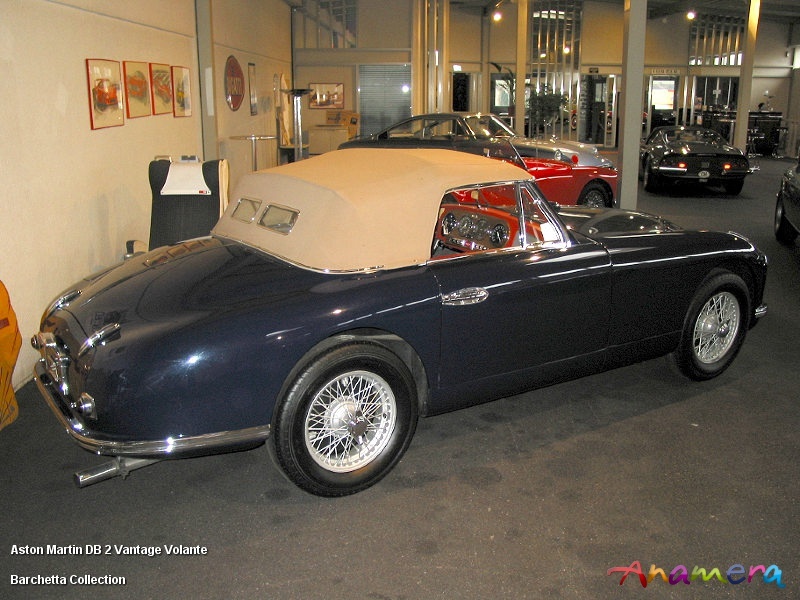 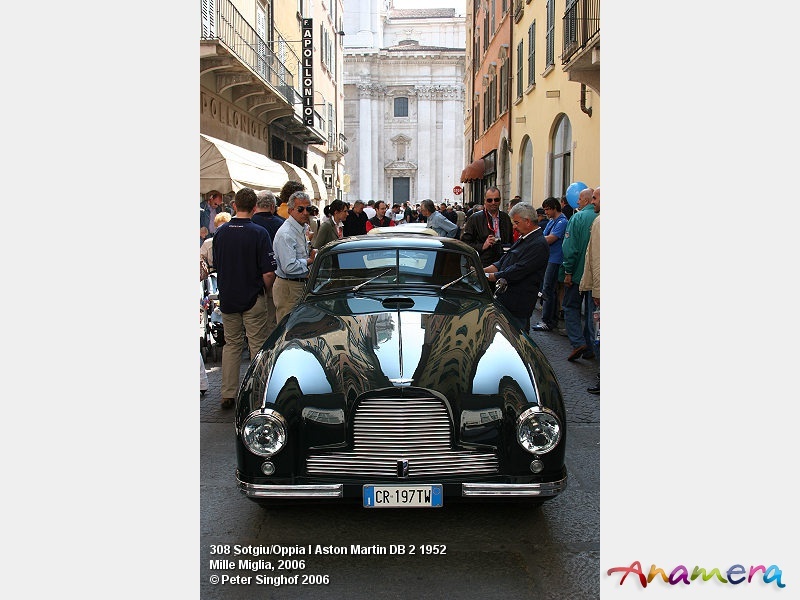 The 1st 49 cars had 3 piece front grilles, before integrating all pieces in one which became the Aston Martin trade mark grill. 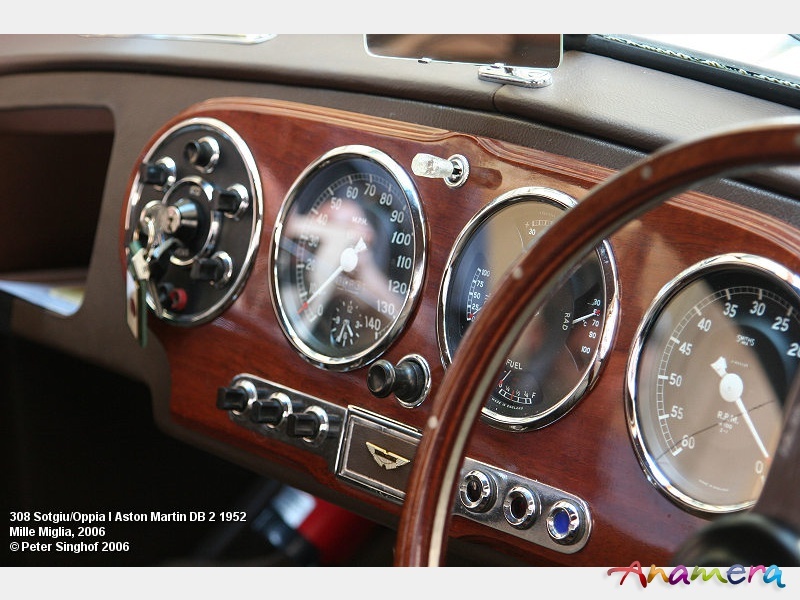 The first engines had a very low compression due to the poor petrol quality. 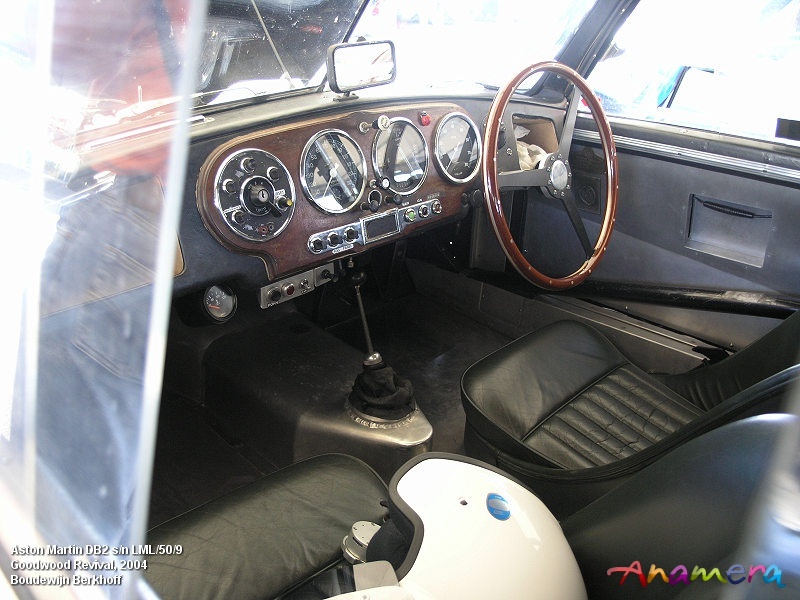 Later a Vantage engine was offered with larger carburetors. 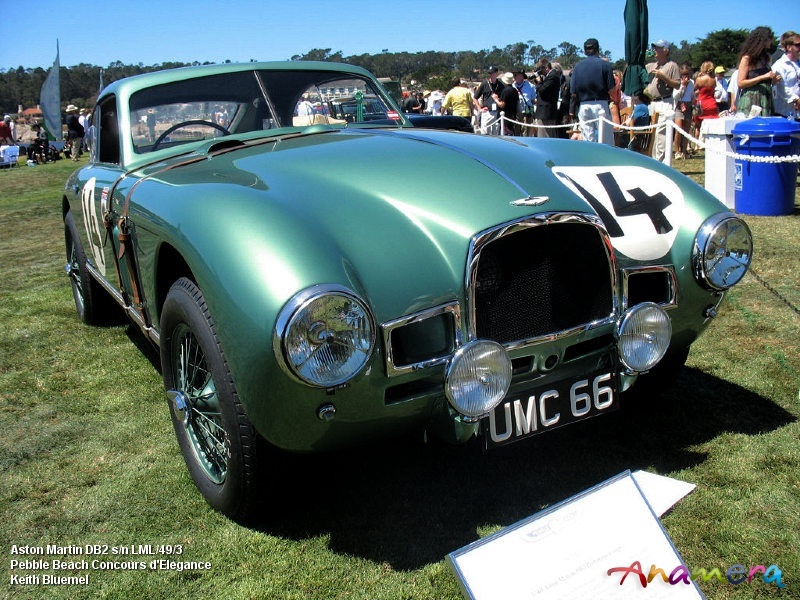 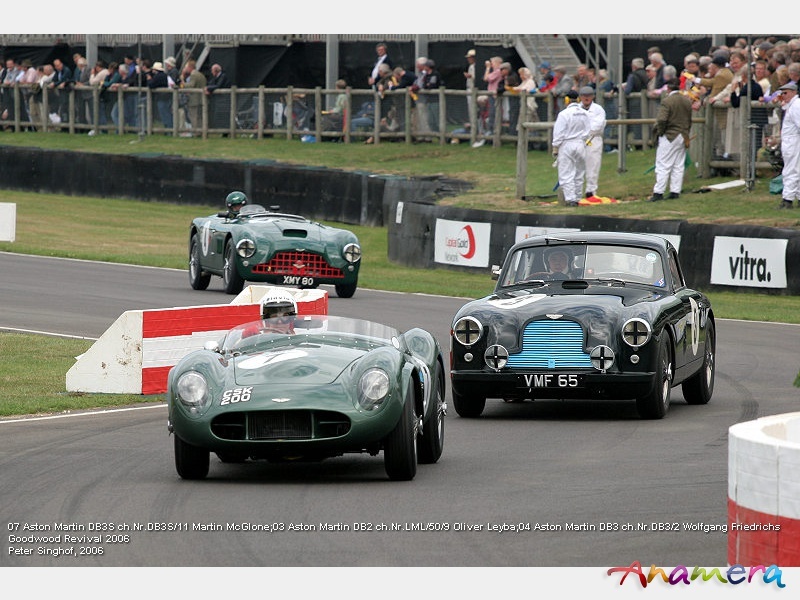 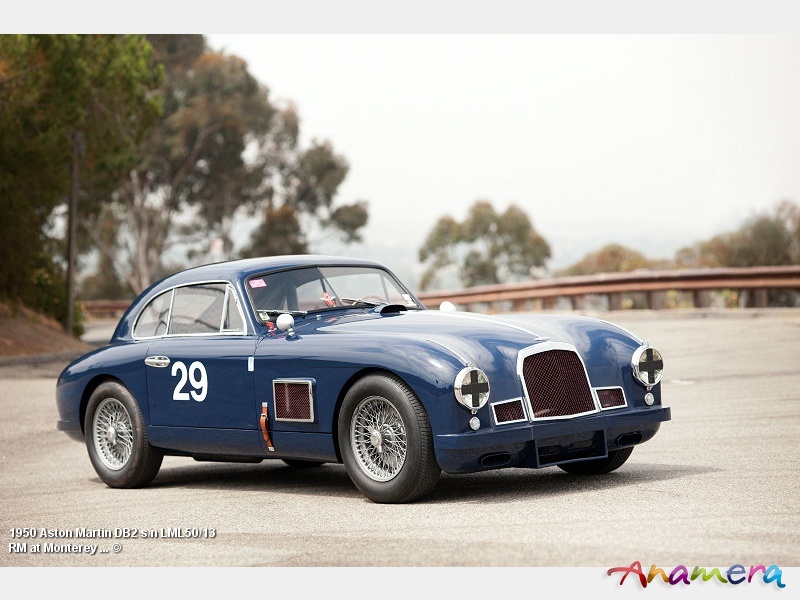 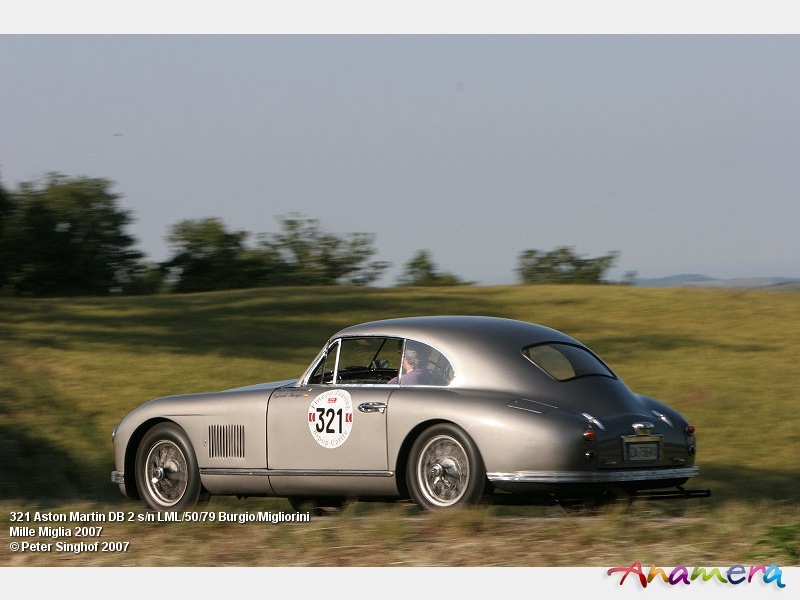 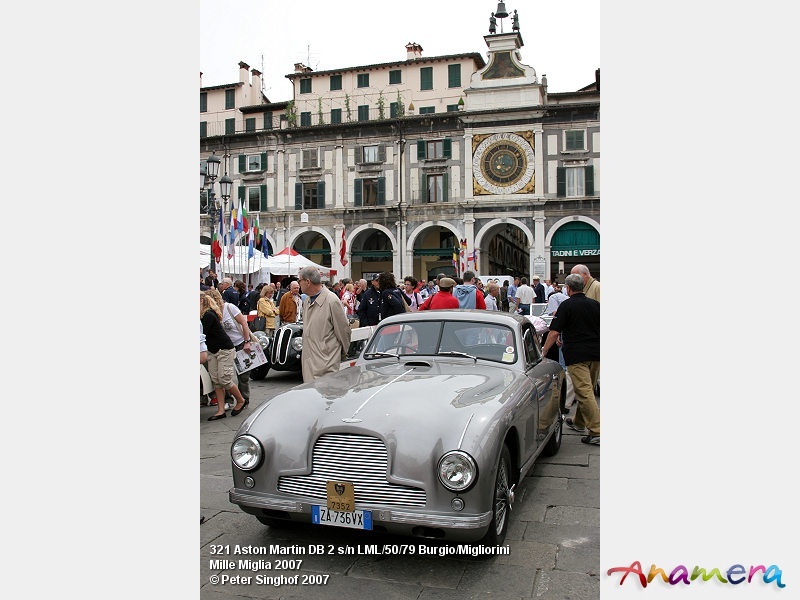 In October 1950 2 Aston Martins DB2 were displayed at the London Motor Show, one Saloon and one Drop Head Coupe. 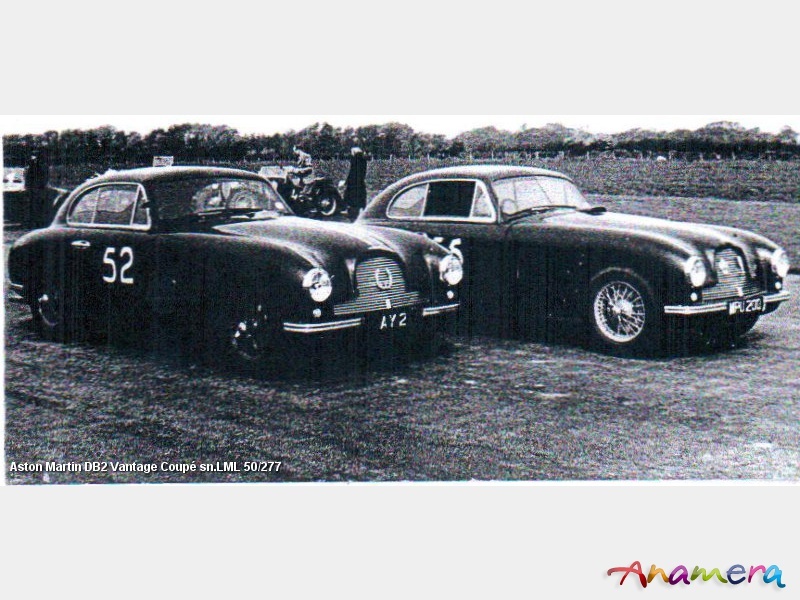 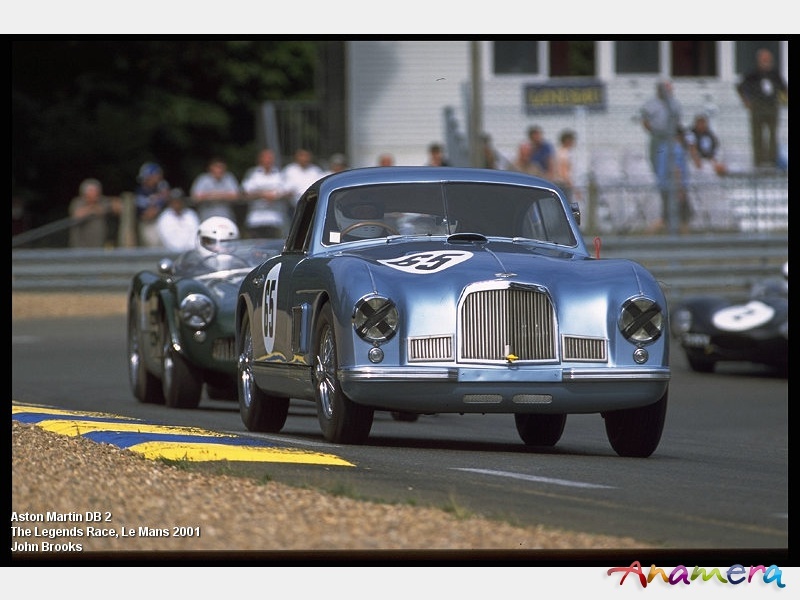 LML/50/7 (VMF 63) and LML/50/9 (VMF 65) had been raced in 1950 24h Le Mans race, in 1951 LML/50/8 (VMF 64) finshed 3rd OA in the 24h Le Mans race, LML/50/10 (VMF 37) was a Drophead Coupe ex David Brown, LML/50/21 was the Briggs Cunningham car. 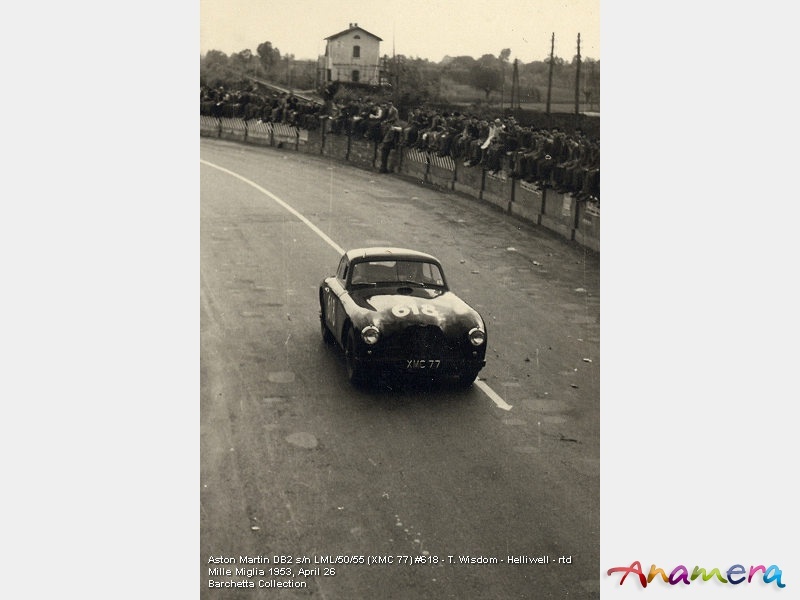 1949 24h Le Mans - 7th OA, 3rd IC - Jones/Haines r#..
1949 24h Le Mans - dnf, radiator - Johnson/Brackenbury r#..
LML/50/88 - Saloon "LUW 400"
LML/50/97 - DHC Graber "DSV 215"
LML/50/149 - DHC "USU 978"
LML/50/282 - Saloon "PUM 777"
LML/50/286 - Saloon "JMR 808"
LML/50/288 - Saloon "NJJ 576"
LML/50/291 - Saloon "PZ 100"
LML/50/292 - Saloon "YMM 52"
LML/50/293 - Saloon, Sykes "XMM 596"
LML/50/308 - Saloon "YXA 334" "NLO 2"
LML/50/311 - Saloon "TPD 2"
LML/50/312 - Saloon, CH "ZH 4696"
LML/50/320 - Saloon, "GBW 907"
LML/50/321 - Saloon, "JMR 537"
LML/50/322 - Saloon, "AJB 1"
LML/50/327 - Saloon, "HKG 20"
LML/50/337 - Saloon, "NLO 943"
LML/50/338 - Saloon, "JKU 877"
LML/50/368 - DHC, B "LLU885"
LML/50/400 - DHC, USA "LUY 800"
411 DB2's were build, of which 102 were Drop Head Coupes, 8 were bare chassis of which 5 were delivered to Graber, Switzerland. 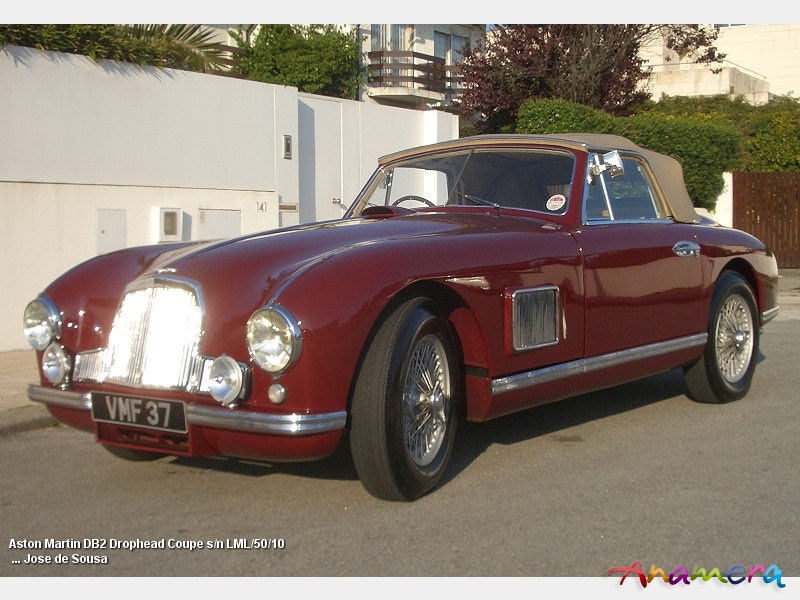 In 1950 1489 Pounds bought Aston Martin Saloon and 100 Pounds more did buy a Drop Head Coupe.